Initiative for Medicines, Access & Knowledge (I-MAK) released a new study yesterday showing that the rheumatoid arthritis drug Enbrel has been overpatented by drugmaker Amgen, which has filed a total of 57 patents on the drug in the United States. Together, these patents were said to delay market competition by 39 years, rather than the standard 20 years for one patent. The study found that this market exclusivity for Enbrel resulted in US$ 8 billion dollars in sales in 2017 alone. 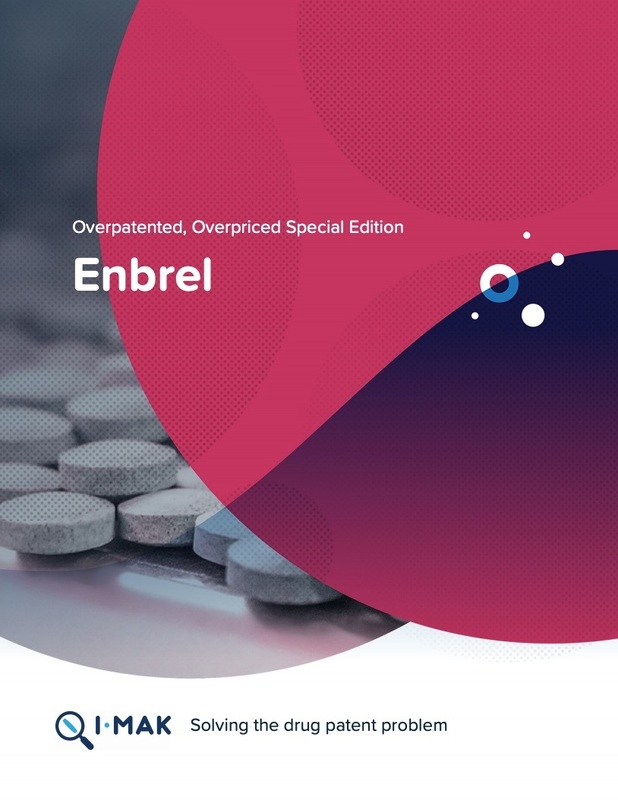 The study, Overpatented, Overpriced Special Edition: Enbrel [pdf], is the third of a series of IMAK investigations into the patenting and pricing of top-selling drugs in the US. Other studies in this series can be found here. “The primary patent on Enbrel in the U.S. was filed in 1990 and expired in 2010. However, there are at least 19 active patent applications and granted patents on Enbrel protecting its commercial exclusivity, the last of which expires in 2029,” according to the study. “The wall of patents that Amgen has established around Enbrel continues to keep biosimilar products out of the market in the U.S., while a biosimilar was launched in Europe in early 2016,” the study concludes. More information on IMAK can be found here. "Study Finds Arthritis Drug Enbrel Overpatented, Overpriced in US" by Intellectual Property Watch is licensed under a Creative Commons Attribution-NonCommercial-ShareAlike 4.0 International License.